Tazor and Trigger. 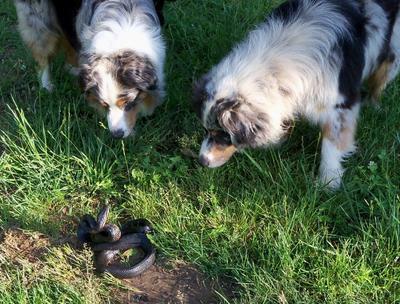 This is a picture of the boys looking at a snake. This is story about my precious Tazor and his brother Trigger. I had searched for 2 years for a blue merle Aussie. I finally found a lady that posted for sale pups. They were 2 weeks old and was letting people pick their pup at proper weaning time so I fell for 2 of them. Kelly, the lady that owned them, sent me pictures each week until I was able to get them. I was so excited. Finally it was time. I drove around an hour to get them. Oh they were beautiful, one was mine and the other was my daughters. So on the way home, I kept telling my husband I had to keep both of them because I couldn't choose—I loved them both. So I got home and put them down, was watching them and Tazer came over and set on my lap and looked up at me, so I knew he was the one. It was a great choice he had the best personality. I started training tricks right away. He was so smart. My daughter took Trigger—he is so beautiful, but a little standoffish with strangers. My precious Tazer went missing a year ago in March. I looked everywhere—no luck. I still look for him. I got another pup last December. His name is Bullet. I have a black tri female—Larkin is her name. I have a litter of pups with Larkin and Trigger, Had 4 blue merles and 4 black tris. I love them all. That is a great picture. Don't you just love their intelligence? I'm sorry to hear about Tazer.